4'x4' Floor Scale 5000 lb. 48x48 NTEP Warehouse page. Rice Lake RoughNReady Floor Scale 4x4 5000 lb. 482 PlusThe Legal for Trade Rice Lake Rough-n-Ready System 48"x48" Battery Powered Floor Scale with 482+ Indicator System has quick connects and factory calibration which allow the package to operate with minimal setup. Includes RoughDeck pallet scale with AC / battery powered digital indicator. NTEP Capacity: 5000 x 1 lb. Price includes freight (cont'l US) to business addresses only (Zoned Commercial) with a loading dock or forklift. Rice Lake Roughdeck Floor Scale 4x4 10,000 lb. 482 PlusThe NTEP Legal for Trade Rice Lake Rough-n-Ready System 4' x 4' Battery powered Floor Scale with 482+ Indicator features quick connects and factory calibration which allow the scale to operate with minimal setup. Combines a RoughDeck floor scale with AC/ battery powered digital indicator. Capacity: 10,000 x 2 lb. Price includes freight (cont'l US) to business addresses only (Zoned Commercial) with a loading dock or forklift. 4'x4' Pennsylvania Platform Floor Scale 5000 lb.This versatile fully electronic 48"x48" mild steel painted Pennsylvania 6600 floor scale is a great choice for any warehouse. Comes with a Pennsylvania 7600+ digital indicator for a Complete Scale System factory calibrated -- ready to use immediately when you receive the scale. NTEP, Capacity: 5000 pounds, best of all this price includes the Freight in cont'l US business addresses only (Zoned Commercial) with a loading dock or forklift. Safety Color Orange Yellow Floor Scale NTEP 4'x4' 5000 lbFloor Scale made in the USA. Painted in your choice of safety yellow or safety orange (please specify when you order). 4x4 Bases are constructed of 1/4" thick tread plate. Shear beam 2.5k-SE load cells are utilized in the bases with 1/2”-20 threaded scale feet. Includes the LP-7510 Indicator. NTEP legal for trade. 5000 x 1 lb. Free freight shipping to lower 48 states. Dock-to-dock for commercially zoned businesses. Safety Color Orange Yellow Floor Scale NTEP 4'x4' 10,000 lbFloor Scale made in the USA. Painted in your choice of safety yellow or safety orange (please specify when you order). 4x4 Bases are constructed of 1/4" thick tread plate. Shear beam load cells are utilized in the bases with 1/2"-20 threaded scale feet. Includes the LP-7510 Indicator. NTEP legal for trade. 10,000 x 2 lb. Free freight shipping to lower 48 states. Dock-to-dock for commercially zoned businesses. Cardinal Ruggedweigh 4x4 Floor Scale with 180 DWI 5000 lbCardinal RuggedWeigh Floor Scale FH-544F-180 comes calibrated to the 180 Digital Weight Readout. 5000 lbs x 1 lb. This system is built with the American consumer in mind. This is the economically priced, Cardinal Floor Scale that you can buy proudly. Price includes freight in continental US to business addresses only (Zoned Commercial) with a loading dock or forklift. Triner Scale 4x4 NTEP Indoor Outdoor Floor Scale 10,000 lb.The versatile floor scale from Triner includes a heavy duty scale platform with 10,000 pound capacity. The digital readout has a SS enclosure. LTL freight ground shipping included (cont'l US) to business locations with forklift or loading dock. Triner Scale 4x4 NTEP Indoor Outdoor Floor Scale 5000 lb.The versatile floor scale from Triner includes a heavy duty scale platform with 5000 pound capacity. The digital readout has a SS enclosure. LTL freight ground shipping included (cont'l US) to business locations with forklift or loading dock. Triner Scale 4x4 NTEP Indoor Outdoor Floor Scale 2500 lb.The versatile floor scale from Triner includes a heavy duty scale platform with 2500 pound capacity. The digital readout has a SS enclosure. LTL freight ground shipping included (cont'l US) to business locations with forklift or loading dock. IS A MADE IN USA 4x4 FLOOR SCALE STILL AVAILABLE? Brand Name Sensortronics™ load cells; premium quality -- like 'Intel Inside' a better high end product. Made in USA -- Support your neighbors and buy quality, not cheap no name & no support foreign imports; Buy AMERICAN! Pennsylania 6600 48" x 48" designs, 1K-10K use the original 10K deck frame and a rigid, Cad-designed structure... they are much more heavy duty than the 'lighter' competitor products. Note: ALL designs are engineered by Cad for correct design with point loads simulated in software before the first piece is cut or welded. Did you know, there are even some "American scale manufactures" out there who don't use drawings. A physical address in the U.S. (Lancaster, PA) where the scales are manufactured that you can count on! To sum it up, what we have done is actually pretty simple. We bring you the best American Made Floor Scales (B-Tek 4Square, Digi Summit 3000, Cardinal Ruggedweigh, Rice Lake Roughdeck & Pennsylvania 6600). Also we should mention that some of the Made in the USA pallet weighers do use load cells from China and/or imported weight indicators. So if you're looking for a 100% made in the USA product, contact us and we can work with you on sourcing that. 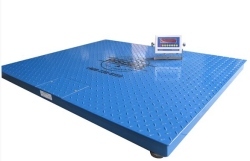 We also do offer some less expensive quality brand name imported platform scales to look over too and we've brought those to you as well with our Salter Brecknell line of floor scales. These Brecknell floor scales are the perfect blend of quality and affordability and ship right to you from Fairmont, MN. Be sure you look at our informative flyer -- Floor Scales 101 (pdf file)... Trust us, try one of our quality 4x4 floor scale systems. Please note, floor scale delivery is to business addresses only (Zoned Commercial) with a loading dock or fork-lift. All other charges (liftgate, residential, construction, military, etc..) are the buyers responsibility.